FAIRFAX, Va. — Alison Price, senior associate dean of the Antonin Scalia Law School at George Mason University, said Tuesday that law school leaders have no plans whatsoever to fire U.S. Supreme Court Justice Brett Kavanaugh, who was recently hired as a visiting law professor. Price made the comments in an interview with The College Fix after she and other campus leaders sat through a roughly three-hour townhall at which students vented their frustration over Kavanaugh’s hiring, saying he makes them feel unsafe and is a threat to their mental well being. Price, who was the only law school administrator present at the meeting, told The Fix the law school “will not fire Justice Kavanaugh” in an interview after the townhall ended. 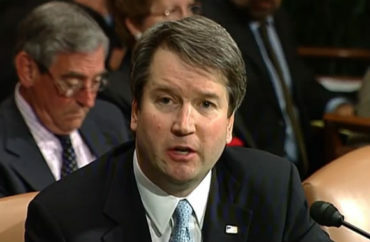 When asked about the “Mason 4 Survivors” petition, which has garnered almost 10,000 signatures and not only calls for Kavanaugh to be fired but also a “formal apology from administration to survivors,” she said she has responded individually to students’ concerns, but that the law school has no plans to formally address the demands. But campus leaders have agreed to some of the Mason 4 Survivors’ petition demands. On Tuesday, they pledged to increase Title IX resources and personnel. 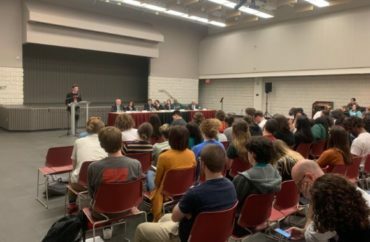 The concessions came after a panel of campus leaders, including President Angel Cabrera, the campus chief of police, and Provost David Wu listened to a parade of students who voiced anger and concern over Kavanaugh’s hiring. They said they felt unsafe and disrespected, among other complaints. Next came a public question and answer session during which students from the audience as well as some of the sexual assault survivors who spoke earlier voiced anger and frustration over Kavanaugh’s hiring. One by one, they asked campus leaders questions such as: why was Kavanaugh hired, what are some of the steps the university will take to reduce sexual assault, and what is the process of reporting a sexual assault overseas? At one point a male student from the audience took the mic and asked: “How many of you have children,” suggesting their kids would be unsafe around Kavanaugh, prompting snaps of support from the audience. The campus police chief, Carl Rowan, replied: “We are listening.” He added he is taking student feedback seriously, that students “are their customers,” and encouraged students to report any concerns to him personally. 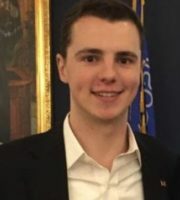 Often, campus leaders responded to students by telling them they would work to improve the campus climate and campus safety and prioritize a shared governance mentality. Price said she would work to relay student concerns back to the law school as well. “My objective for being here and wanting to hear from you is that I want to make sure that the law faculty knows that it is important to evaluate and consider — and I don’t know, again I wasn’t involved in the proceedings, but I want to ensure going forward that the law school is thoughtful for the implications for all students, and so I appreciate hearing from everyone tonight,” Price said.